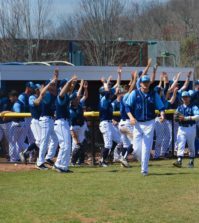 The Quinnipiac baseball team came into a four-game weekend home series tied with Monmouth for first place in the Northeast Conference standings. But a no-hitter from senior Kyle Birdsall Saturday proved to be the only way the Bobcats could beat the Hawks. The Bobcat defense was unable to overcome a strong offensive effort from Monmouth in Sunday’s finale, falling 8-4 at Quinnipiac Baseball Field. 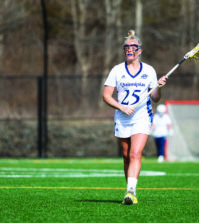 Quinnipiac dropped into a tie for third place in the standings while Monmouth took sole posession of first. Monmouth’s third baseman Danny Avella hit his fourth home run of the weekend, putting the Hawks ahead 3-0 in the first inning. Quinnipiac got one run back in the home half on Chris Migani’s single to left field, driving in Mickey Amanti, who led off the inning with a single. Quinnipiac pitcher Anthony Cinelli allowed four more runs in the top of the fifth during a two-out rally. 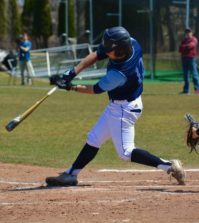 Monmouth’s Owen Stewart and Cal Castanzo each drove in one run, and a single from Jon Guida scored two more. Cinelli allowed seven runs on seven hits. Spencer Kane came in to relieve Cinelli and allowed the final run of the game. Trailing 7-1, Joe Poletsky’s RBI walk brought in Guerino followed by an RBI single from Kyle Nisson. Ben Farina, who walked earlier in the inning, stole home on a wild pitch, closing the scoring gap to 7-4. But the sixth-inning rally was not enough, as this was the last time the Bobcats reached base. “We battled back the best we possibly could,” Gooley said. Monmouth’s Castanzo drove in the final run of the game on a sacrifice fly. Quinnipiac only had five hits for the entire game and two came from Amanti, who extended his hitting streak to 16 games.